It was a nice statistical day for Matt Ryan, but he continued his so-so outdoor performances, failing to hit the heights we often see out of him in a dome. Two of his touchdowns came as a result of busted coverage, as the Falcons’ offense took advantage of chunk plays to score points. It was a game the Falcons were grateful where none of their offensive linemen really stood out. They lost some battles in pass protection but generally held up just well enough, while there was some good work on the backside of zone plays by Jake Matthews in the run game. 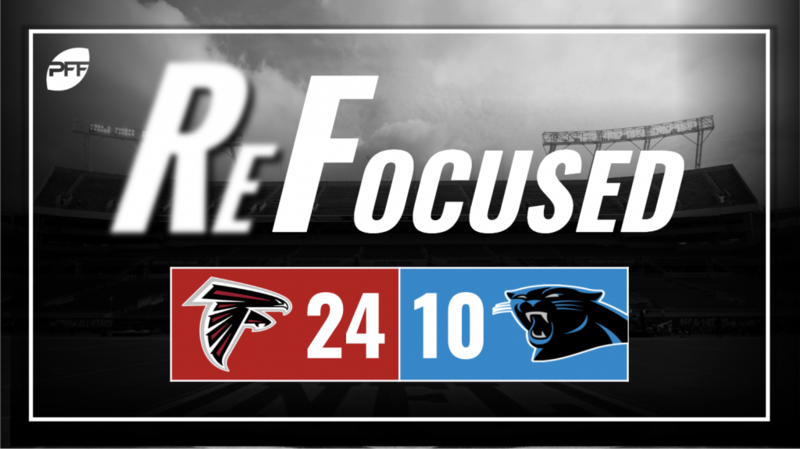 It may have been a quiet first half for the Falcons’ pass-rushers, but with Carolina forced to go pass happy, it was pin your ears back time against a bruised and battered Panthers offensive line. Takkarist McKinley was arguably the most proficient here, as he worked over Marshall Newhouse, especially in the fourth quarter. How different could the Falcons’ season of been if not for an early injury to Deion Jones? He started off the game struggling to get ahold of Christian McCaffrey, but by the end, we were starting to see glimpses of one of the best linebackers in the league. The play of the game came on the incredibly quick sack, strip and recovery by Kyle Love that essentially undid the Panthers’ own turnover. In a more meaningful game and with a different Carolina offense, it would have left a bigger mark, but it was indicative of an extremely active effort by Love. After giving up a first down on the Falcons’ first offensive pass, you’d understand if James Bradberry was beginning to think if he was in line to be on the wrong end of a Julio Jones highlight reel. But despite that play and getting beat for a touchdown, Bradberry showed himself to be more than a match for the Falcons receivers for most of the match with a couple of nice pass breakups. It was far from a disaster from Taylor Heinicke, who made some nice throws and plays with his legs. But after returning from a wrist injury, he was noticeably skittish in the pocket, costing his linemen leverage and becoming more erratic with his throwing as the Falcons sent pressure often. We saw the rarest of things in the NFL; a Panthers offensive series where McCaffrey was not on the field. The dynamic dual-threat was once again the majority of the Panthers’ offense, and while that makes him a great fantasy player, you do worry about his longevity if they cannot harness and use the talent around him. They got into a lead and forced the Panthers into the one dimension they really didn’t want to have to rely on. With injuries on the offensive line, they are not built to be a pass-first team, especially with a backup quarterback lacking in experience behind center.